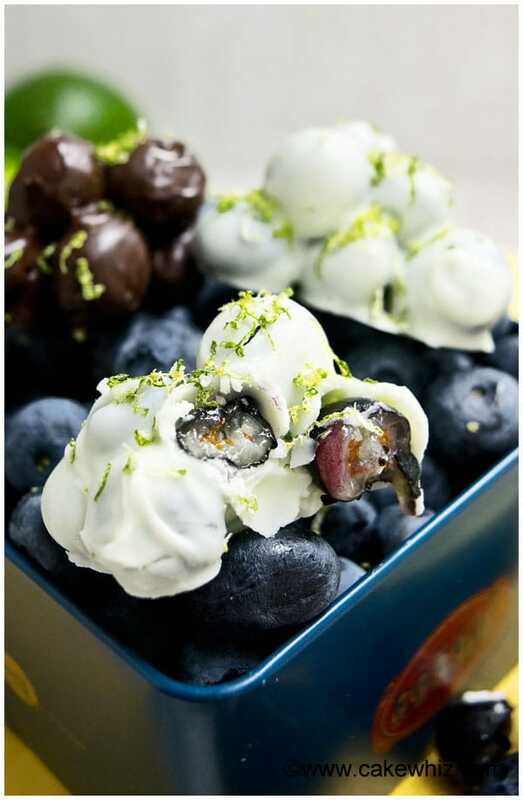 Quick and easy chocolate covered blueberries recipe- Healthy snack/ healthy dessert for Summer. These blueberry chocolate clusters require 3 ingredients! 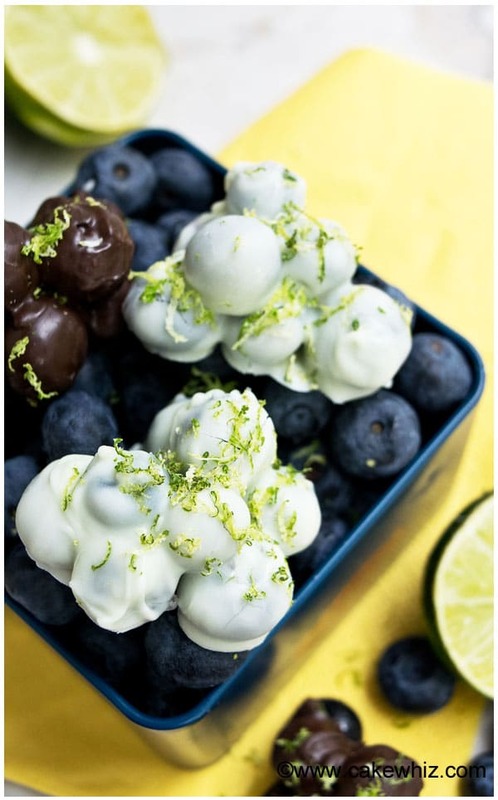 I seem to be on a lime KICK lately, which resulted in these chocolate covered blueberries, topped off with lime zest. I think I have reached a phase in my life where I have just gotten BORED of using lemons in my cooking and baking and prefer limes instead…hehe. I made WHITE chocolate covered blueberries, MILK chocolate covered blueberries and even DARK chocolate covered blueberries. The dark chocolate ones looked the most unfortunate but seriously, they tasted the BEST! 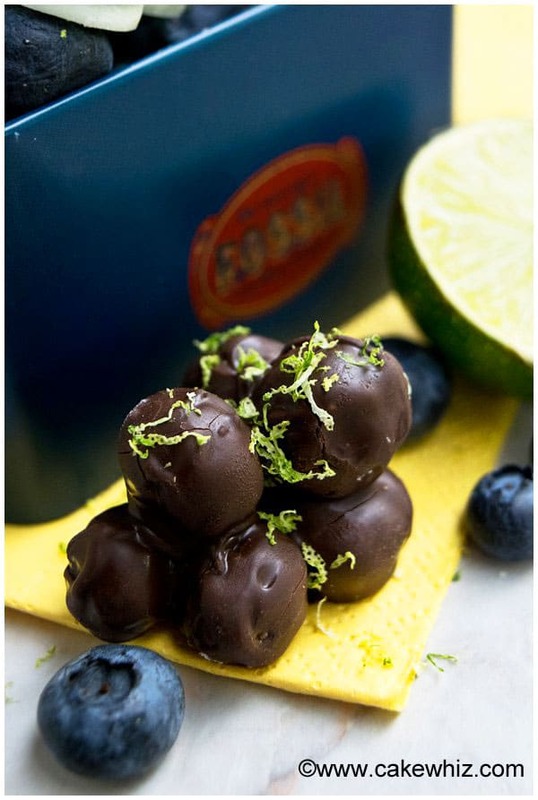 The DEEP chocolate flavor paired wonderfully with the slight SWEETNESS and TANGINESS of the blueberries and the fresh lime zest just took them over the TOP! My hubby loved the white chocolate ones. I am sure everyone will have their own PREFERENCE. Are chocolate covered blueberries healthy? Are chocolate covered blueberries good for you? Yes, especially the dark chocolate ones. 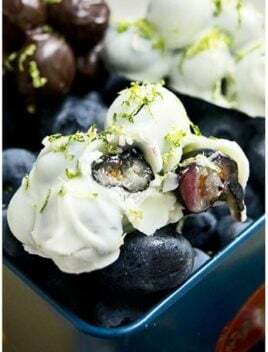 They are a great skinny snack or skinny dessert and an awesome post workout snack, made up of ingredients that are good for your health: dark chocolate, limes and blueberries. 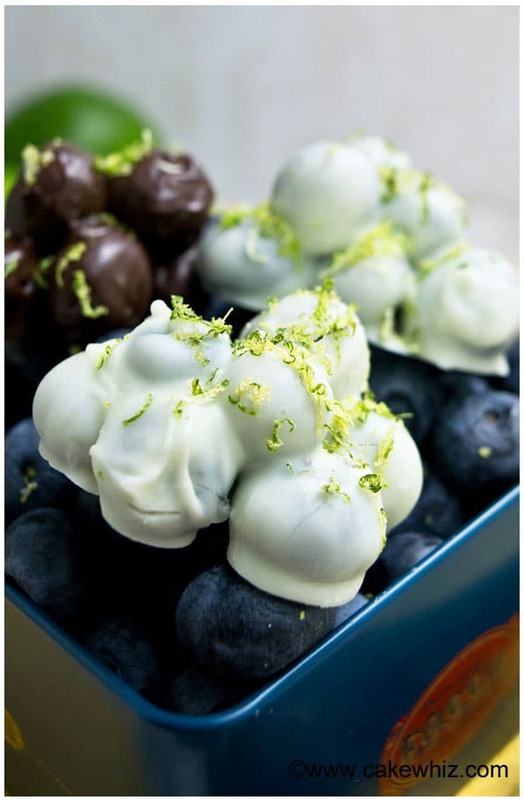 How to make chocolate covered blueberries? The process is very simple. Start off by melting chocolate in the microwave. Then, dump the blueberries in this bowl of chocolate. Use a fork to scoop out clusters of blueberries and place them on a sheet of wax paper. Sprinkle some lime zest on top, if you like. Let the chocolate set and enjoy! How long do chocolate covered blueberries last? About 2 days in the fridge. Use the BEST quality of quality you can find. Your recipe results will only be as good as the ingredients you use. DON’T skip the lime zest. I really think that gave them an extra boost of flavor and took them up a notch. If you are not fond of limes, you can also use lemon zest or orange zest. To make a blueberry chocolate bar instead of clusters, use a rectangular chocolate mold. You can REPLACE blueberries with your favorite berries: Strawberries, raspberries or even blackberries. YUM! Since fresh fruit is used in this recipe, I suggest storing LEFTOVERS in a sealed container in the fridge for no longer than 2 days. In a microwave-safe bowl, melt chocolate. Dump the blueberries in the bowl and gently mix everything together. Use a fork to to scoop out 6-7 blueberries from the bowl and place them on a sheet of wax paper in a small cluster. Toss some lime zest on top of each chocolate cluster. Continue dipping and scooping out blueberries and make as many clusters as you like. Enjoy! Read all my notes above.